Image registration allows us to determine the deformation an object undergoes following changes in loading based only on a series of images. In other words, what deformation is required for one image to look like another image of the same object. For example, the images above represent the diastolic (top left) and systolic (top right) states of the heart. We would like to know what deformation was required to make the diastolic image look like the systolic image. Unlike other image registration methods, Hyperelastic Warping allows for the inclusion of material properties of the tissue as well as any loading information that may be available. These analyses give us strain informaiton based ob many different types of medical imaging. 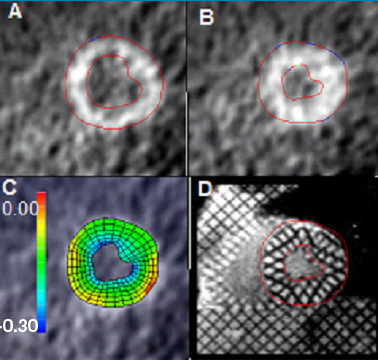 Cardiac deformable image registration has been validated using tagged MRI (bottom left and right).